To start, I made plans to stay with a good friend of mine and her friends; they came in on Day 0, but I chose to stick to my plan of waiting until Day 1 to come, as my friend and other roommate who I was carpooling only had Days 1 through 3 off from work. For $34, we got a room at the EconoLodge, which was about five blocks away from the convention center; this would necessitate me coming back accompanied by someone every night for safety reasons. I picked up my friend, who lives in San Mateo, around 10:30 AM, and we went on our way, crossing the San Mateo Bridge, and long story short took a route that cut through I-580 and eventually I-5 in order to bypass the Carquinez Bridge toll. We made a food stop at a Chevron in roughly the middle of nowhere along the highway, grabbing sandwiches at Subway before continuing on our way, arriving at around 1:30 PM at our hotel. Our other friend arrived at the hotel, having attended the Kill la Kill gathering earlier that day. According to her, all of five people showed up, mainly due to the gathering being at 10 AM. Friday morning or even early afternoon is a sure-fire "death slot" for anyone hoping to get people to come to their event. Three years ago, I had to have a panel I host be rescheduled from Friday at 11 AM to Saturday morning, as not only would I not be in Sacramento by 11 AM that day, but I didn't even arrive until 8 PM that day due to traffic as a result of having to pick up someone from San Francisco at 3 PM. A year and a half ago, there was a Touhou gathering at 1 PM on Friday, and I was still on the road when that happened; from what I was told, attentance at that gathering clocked in at about 10 or so. So the three of us rested up before proceeding to the convention center at around 2:45 PM. I swung by the Sheraton to pick up my press badge, which went without any hassle, and happened to run into Matt while I was there. I didn't spend much time in the press lounge, but there were several jugs of water to drink. Having complimentary water to drink was a huge plus, and not something seen at many conventions, and it helps that Sacramento has a reputation for exceptional water quality, which is effectively required due to the high volume of water that Sacramento residents tend to use. After getting my press badge, I went down to the lobby to spend time with fellow attendees, before heading up to the gaming rooms to see what was available to play. The usual fighting games and first-person shooters were present, as well as a decent variety of music games, and all three rooms had complimentary water as well, helping to make sure that visitors get the hydration needed to survive the convention. Someone brought a Pump It Up setup complete with a pair of arcade pads, which I would've played on at some point during the convention if I wasn't constantly in cosplay that I didn't want to wreck by sweating so much. As for the convention center itself, I noticed a few things different from my last time attending. First, there was the local Greek festival going on at the same time; more on this in Day 2. Second, the convention now used both the 1st and 3rd floor of the convention center, using the newly-added space for panel rooms and the like. (The 2nd floor is just a landing connecting the 1st and 3rd floors), This meant more space to roam around and therefore a higher attendee capacity. The Dealer's Hall was still largely like previous iterations: dealer's and artist's sections in one big hall. I didn't spend any money in there, as I didn't find anything worth buying, although this did help facilitate in me having money for food; more on this soon. At 6 PM, Matt, Nate, and I came back to the press room for a press interview with Cristina Vee, Christine Cabanos, and Danielle McRae, the former two of whom I know as the English dub voices of Madoka Kaname and Homura Akemi from Puella Magi Madoka Magica. As shown in Matt's Day 1 post, I helped out with recording the interview. Afterwards, we needed to decide on where to get food. After some deliberation with some of our other friends, we decided on a Sacramento hotspot: Squeeze-Inn, a restaurant specializing in burgers and fries. 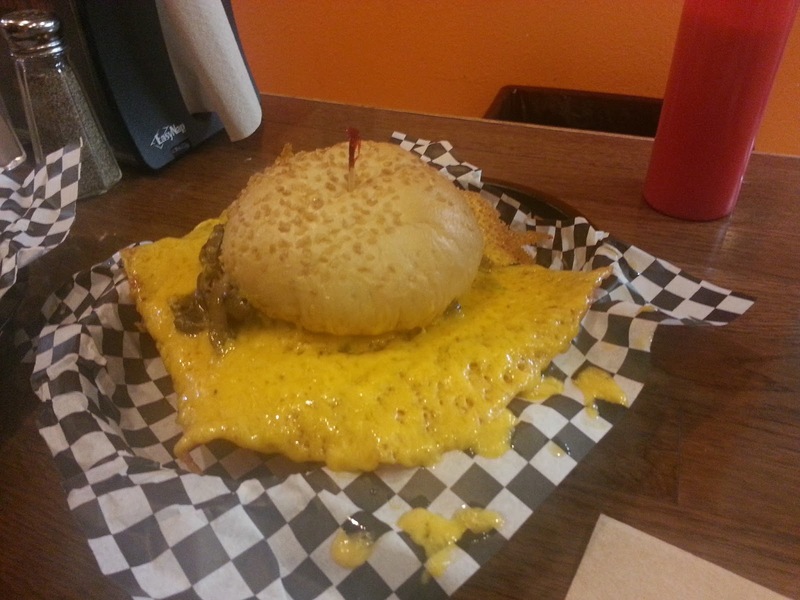 I was prepared to have a nice juicy burger, alongside some cheese fries that Matt and I split. What I was not prepared for was their famous "cheese skirt". It was greasy. I felt like I gained 15 kilograms just by eating away that cheese skirt. But it was so good, and so was the rest of the burger. Following this, we went our separate ways upon touching back at the con center. I didn't do a whole lot of value, so eventually I went with some friends back to my room to prepare for the next day. Day 2 is the convention's sole full day, which naturally means it is the most content-packed day of the con. After my friends and I put on our cosplays--me putting on my usual Reimu Hakurei (from Touhou Project) cosplay, we made way to Subway for breakfast, arriving around 10 AM. Expecting Subway to be full of fellow hungry congoers, we got our sandwiches surprisingly quickly, with the line only starting to build up as we were finishing our meals. At 1:30 PM or so, my friends and I attended CWF BLKOUT, an event hosted by what's known as the Cosplay Wrestling Federation. No, there is no actual wrestling involved, for obvious reasons. Rather, CWF revolves around participants coming up and carrying out smack-talk speeches in the style and spirit of professional wrestling--anyone who has watched pro wrestling knows that part of the fun of watching it isn't just flashy moves, it's also the acting and story that goes into painting a fictional world that is played out in the ring to thousands of live attendees and millions of viewers through television. Everyone participating put on their best larger-than-life personalities, with the top three going on to "duel" against the reigning champion for the title, for a rather amusing and amazing experience. And this isn't just a Sac-Anime-exclusive event; the two showrunners take their events to other major California conventions as well, such as Fanime, Anime Expo, and ALA. Afterwards, we needed to get food, and it seems we were in a sushi mood so we made for a restaurant known as Mikuni Sushi. Though it is a sushi bar, half of us ended up ordering bento boxes or bowls. 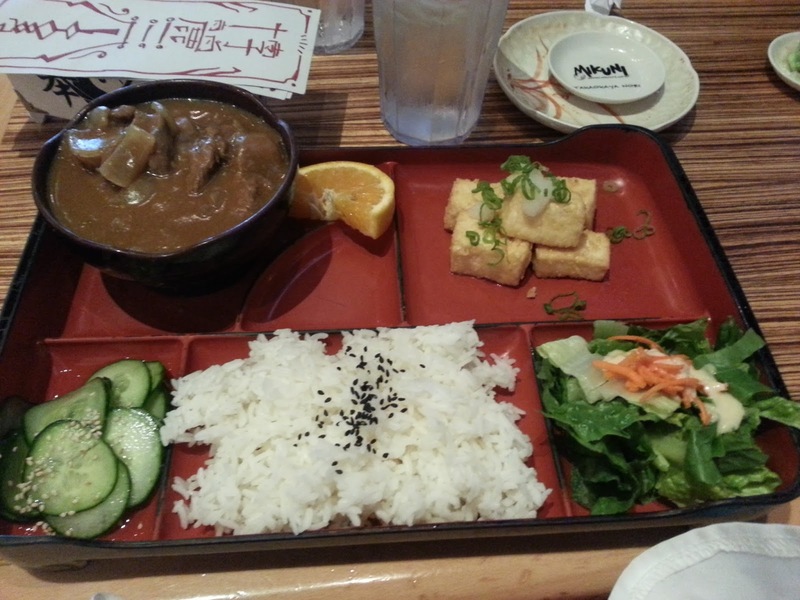 I personally got a custom bento with beef curry and tofu, and it wasn't a good value to be honest; the tofu wasn't much and the curry was lukewarm at best. I'll probably actually try sushi next time I'm here. Most of the rest of my time was spent playing games or with friends; around 8 PM or so, we went over to the Greek festival, which was taking place in the same convention center, though relegated to a single main hall. It was normally $5 for entry, but Sac-Anime attendees got in for free with their badge; most likely an effort to take advantage of Sac-Anime to attract some extra attendees. There were many outlets selling various Greek arts and crafts, as well as a music and dance show going on, but most of us were interested in getting food. One of the food outlets was serving a variety of entrees, so I lined up, willing to brave the 20-minute line, and grabbed myself a plate. 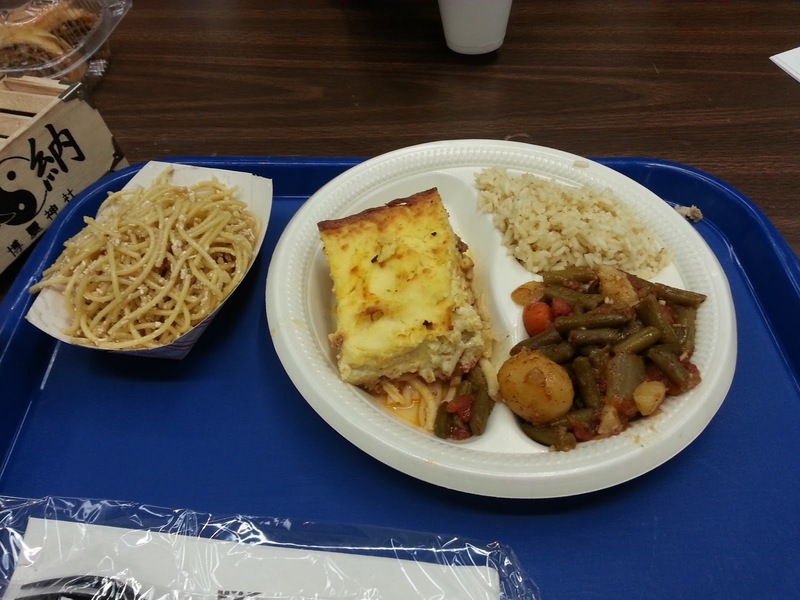 I got some rice pilaf, veggies, a macaroni lasagna dish (the name of which escapes me, sadly), and The Old Spaghetti Factory's signature spaghetti with mizithra cheese and browned butter. A little costly at $17, but I could forgive the pricing due to the fact that it's a festival and therefore food will be a little expensive to compensate for venue fees, and besides, the food was excellent; I found myslef scraping off mizithra cheese just to get a few final tastes in my mouth. We all somewhat parted ways again at this point; two of us had to leave because they were not going to be around for Sunday. I went off to play more games and lurk the convention center, before wrapping up and heading back to my room. Day 3 began with my roommates and I packing up, naturally, and in between parts of that I also decided to cosplay as Renko Usami, also from Touhou Project, today. I also learned that I was not authorized to park at the EconoLodge, as my car was not registered with the hotel staff, and in hindsight, I was quite lucky that my car didn't get towed, which would've been a disaster as two of my friends and I would have no place to store luggage until the end of the con. At any rate, I drove out of the parking lot and parked closer to the convention center, parking at a meter; as it was Sunday, parking in metered spaces was free and had no time limit. Like yesterday morning, we made for Subway for breakfast; this time we never saw the line form beyond more than four people or so; we deduced that everyone was too busy packing and/or leaving to crowd the store for breakfast. We then made for Dealer's Hall, stopping by Toylet, the one booth in the Dealer's Hall selling a decent volume of Touhou goods. I didn't buy anything, but my friend bought a mystery bag for $40, and she got lucky, as among her spoils was a copy of Touhou Seirensen ~ Undefined Fantastic Object. She then went off to get an autograph with Rodger Bumpass, the voice of Squidward Tentacles from Spongebob Squarepants. Apparently, autographs were $10 at first, but now they were free, hence why she took off. As for me, I swung by the Greek festival again for more food, because I just could't stay away. 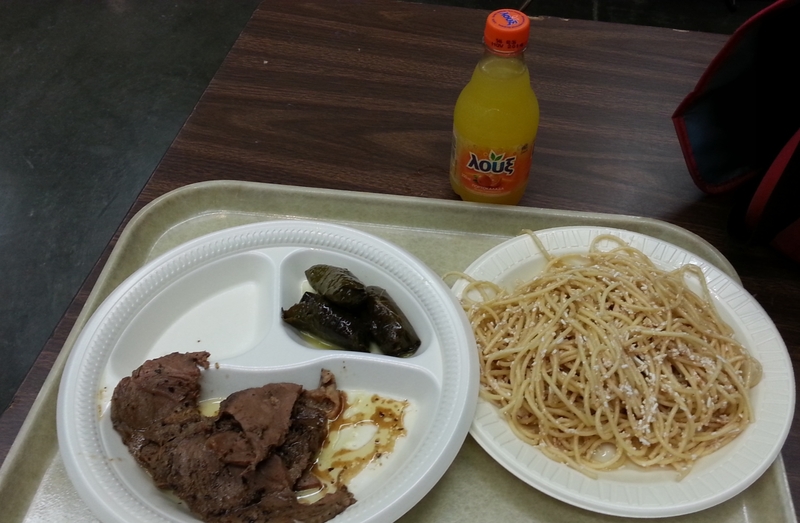 I went for a large plate of spaghetti this time, and I also got some lamb and veggie dolmathes--pockets of vegetables wrapped in edible leaves, and had an orange-flavored Greek soda for my drink. On my way out of the convention center to go to the Sheraton, someone called me out by my character's name and asked to take a photo. I was pleasantly surprised; this was the first time I've had someone I don't already know and outside of a Touhou-themed event actually recognize who Renko is! I expressed how delighted I was before parting ways. I made some final sweeps around the Sheraton and convention center, taking the time to relax for a bit with some friends, before we made for the 120-mile journey back home. On the way back on I-80 West, we passed by a large neon sign for a restaurant called the Milk Farm Restaurant, and were curious to try it next time we were in Sacramento. Unfortunately, that hope went out the window as I learned that the restaurant had closed down before I was even born, the sign remaining up as due to its iconic nature. We made for a food stop in Pinole, getting dinner at Carl's Jr. and drinks at Starbucks. My friend told me that my hair made me look like an 80's rockstar, and I found that incredibly silly so I put my wig and hat back on as I got out of the car which, incidentally, made me feel less strange-looking. I've gotten used to crossdressing/crossplaying to the point where as long as I'm with a friend and someplace safe I don't feel awkward walking around in a skirt. After that, I dropped my friends off, changed back into shorts, and went home back in Santa Clara to get a nice long rest. 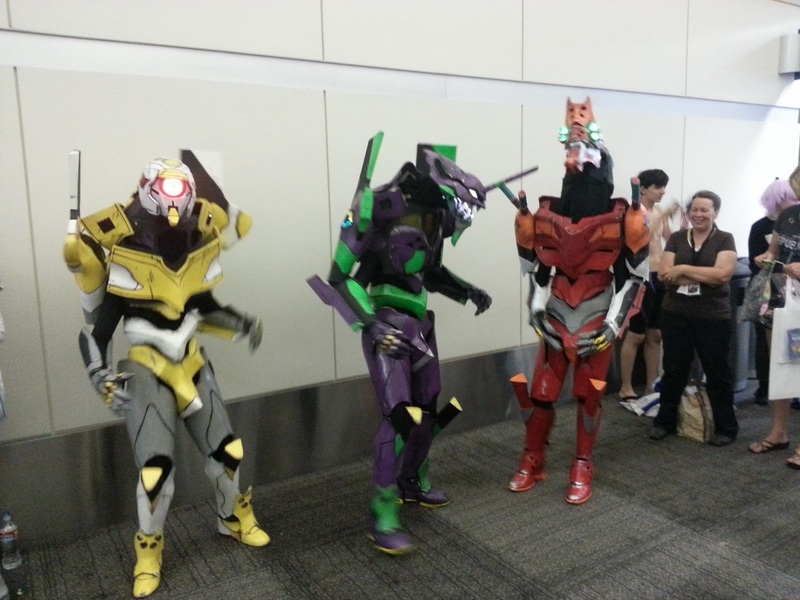 Sac-Anime feels bigger since the last time I attended, having expanded to use more of the convention center. Other than that, it's still a lot of the same. I later saw posts on Facebook taking note of the high volume of Homestuck cosplayers who were being exceptionally rude and rowdy at the convention. I'm not surprised, as Sac-Anime's attendees have been known to be younger and--to put it bluntly--less mature on average than attendees at other cons, though this isn't the convention's fault. A concern I saw regarding such cosplayers was cosplayers who wear body paint but don't seal it, resulting in the body paint smearing on whatever surfaces they touch. In hindsight, I feel lucky that I've never had someone cosplaying a Homestuck troll get their body paint all over me. Programming was relatively unappealing to me, other than CWF; there really wasn't much in store that appealed to me, although I can chalk that up to being generally behind the times when it comes to anime and mainstream video games. A lot of my time was spent either lounging around or playing in the three game rooms. I'll probably go back for Sac-Anime Winter, if only to attend a Sac-Anime set during a time of year that lends better to warmer cosplays. It's not the best con in the state, but I've seen worse, and I enjoy the company enough to want to come back. See you in January, Sacramento.